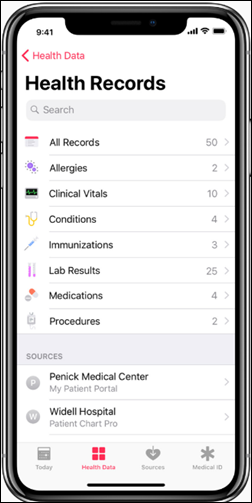 Apple announced Wednesday an update to the IPhone’s IOS 11.3 beta that will allow consumers to view their EHR information from one or more participating providers within Apple’s existing Health app. I spoke to insiders at some of the beta sites to get more information. Patients will be able to view information extracted from the provider’s EHR that includes their allergies, conditions, immunizations, lab results, medications, vital signs, and procedures. The encrypted information is stored on the user’s IPhone rather than on Apple’s servers. Apple will not be able to see the information unless the user gives their permission. The EHR-to-Apple connection goes beyond the extraction of patient-downloaded C-CDA documents, which Apple Health already supports (pictured above). 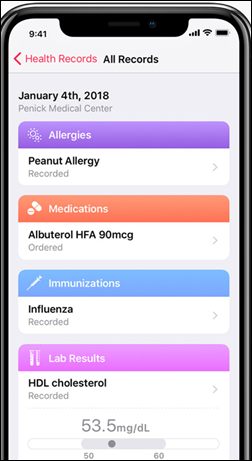 Apple Health Records retrieves discrete data directly from the EHR using HL7’s Argonaut FHIR standard, triggered by the user’s interaction with Health Records. Patients of Epic-using health systems, for example, log into their MyChart account, retrieve an authorization code, and agree to share it with Apple. They then receive a token. “The process is slick,” a provider told me, adding that the process will likely be further polished and hardened to allow hospitals to onboard more easily. Epic will most likely productize the access method via an App Orchard app. It’s important to note that Apple, unlike consumer medical records competitors such as Google, sells only hardware. Apple doesn’t develop enterprise apps, sell or use patient data, or have ambitions to build or acquire an EHR company. “Their only goal is to sell more IPhones,” a health system source said, adding, “we’re a lot more comfortable working with them than other companies with less-transparent ambitions.” Having direct access to EHR information is a differentiator from Android-based competitors whose market share is increasing over the IPhone. The IPhone presents more than just a static display. Allergies include severity levels and lab results include the provider’s normal range and an explanation of the results. I asked an insider about the testing involved and was told that Apple “does real testing, not just the usual hospital user acceptance testing.” That person was also impressed with the depth of health IT expertise that Apple has hired. Apple in mid-2016 acquired startup Gliimpse, which was developing a platform by which consumers could collect and share their health information. That company described itself as, “Gliimpse solved the hardest medical data problem, aggregation plus standardization. Our product collects data from medical portals – without human intervention – combined with self-entered plus wearable info, all shared with others. Through Oauth & APIs, partners can build consumer and analytic apps.” Some of that technology or subject matter expertise presumably found its way into Health Records. Apple is also working on a variety of health sensors. Apple is losing smartphone market share worldwide, though it leads the industry in profits. It is not likely that an Android phone maker can muster the resources and ecosystem control to develop something similar, although Google may try if it can enlist hospital development partners. Google retired its Google Health app due to lack of adoption after just four years in 2012, before the widespread use of EHRs, interoperability standards, and personal health devices. It ended up being a little-used place for people to manually enter their own health information that was then stuck inside the app. The mainstream press is dutifully re-wording Apple’s announcement, but is missing some significant but unstated points that will impact the health IT industry. Patients can store information from multiple health systems on their phones, turning themselves into mini-HIEs as they can simply show any other provider their aggregated information. Apple fixes the patient identification issue that plagues HIEs by requiring the patient themselves to establish the connection from the EHR patient portal’s log-on. Apple’s use of the FHIR standard gives it the capability to extract any information supported by the FHIR standard and the specific EHR vendor. 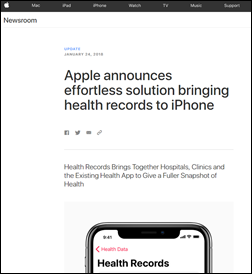 Apple’s high-profile rollout will not only sell more IPhones, but will also encourage patients to press their providers to offer EHR connectivity to Health Records. It will also increase consumer use of patient portals. Consumers trust Apple and will be encouraged to think of their medical data as their own since it will be in the palms of their hands. App developers can build products that use previously inaccessible patient information, having Apple as a single, reliable data source instead of being hamstrung by a hospital’s EHR vendor and the technical intricacies of FHIR, vocabulary, and data validation. App developers can list their products on Apple’s App Store – as Epic and Cerner do — instead of only in the EHR vendor’s marketplace since they are directly installable by any consumer without prior arrangement, giving those apps a wide audience and easy monetization. 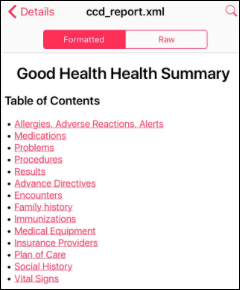 Possible apps made possible by Health Records include medication information or cross-checking; further interpretation of lab results; patient education tools based on actual patient data;combining activity data that is already being collected within the existing Apple Health app with newly available provider data; and sifting through real-time information updates to provide alerting of relevant changes. Oh boy – Epic is going to get so mad…. is this the beginning of the end where consumers finally take hold of their own data? I must be missing some obvious point here. How will Apple market this app to Epic MyChart users? Positives: Can likely have info from multiple providers in one location instead of pulling up MyChart accounts from each provider. Negatives: I didn’t see any patient access or billing topics and no provider messaging. So, user would still need to access MyChart to view upcoming visits, manage appts,. make payments, complete forms/questionnaires, update demographics, start an E-Visit. No Mavrickgirl, Epic actually created this initiative with Apple. 10 of the 13 sites involved are Epic sites and each of them will tell you Epic supported them in this endeavor. Epic has had Lucy and VDT and full access for Open Notes sites for a very very long time.